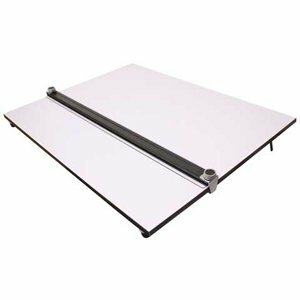 These portable, compact drawing boards feature a smooth, warp-resistant Melamine-coated surface and a built-in easy-grip parallel straightedge with clear acrylic edges, eliminating the need for a T-square. They're great for on the go work and are the perfect alternative to a drafting table for students, artists and designers. The boards can either be used flat or at an incline. The sturdy metal legs with rubberized grips are set at an angle so they won't collapse unintentionally, while the rubber grips on the underside of the board allow you to bring the work surface closer and overhang the table edge at the perfect drawing angle. The precision-made parallel straightedge accommodates paper, board or other material with thicknesses up to 3/16" and the side knob locks the straightedge securely in any position while you work. Wire and part replacement sets are available (AA27008 and AA27009).